People that lived in the towns during Colonial times often worked at a specific trade. Here are some of the typical trades of Colonial America. The apothecaries of colonial times were similar to today's pharmacists. They made medicines from various minerals, plants, and herbs and sold them in their store. Sometimes they acted as doctors, prescribing medicines for the sick and even performing minor surgeries. Like some drugstores today, the apothecary often sold items besides medicines such as tobacco and cooking spices. 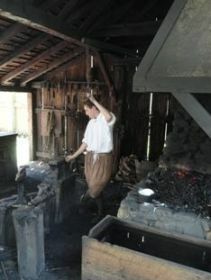 The blacksmith was one of the most important tradesmen of any colonial settlement. They used a forge to make and fix all sorts of iron items such as horseshoes, tools, axe heads, hammers, nails, and plowshares. When the first settlers arrived in America they made their own furniture. However, as the colonies grew and became wealthy, cabinetmakers became a specialized trade that made high quality furniture. Popular items included tables, chairs, and desks. The chandler was a merchant who specialized in making candles. Candles were an important item in Colonial America because they didn't have electricity for lights. Candles were usually made from tallow, but could also be made from bayberry or myrtle wax. To make a candle, the candlemaker would repeatedly dip a wick into heated tallow or wax until the candle reached the desired size. The early settlers made their own candles. An important trade during colonial times was the cobbler who made and repaired shoes. Some larger towns would have multiple different cobblers. Cobblers would often specialize in different types of shoes. They might make just men's shoes or just women's shoes. The most prestigious shoemakers made men's boots. The cooper made different containers such as barrels, casks, and buckets. These containers were important in colonial times for storing all sorts of items including ale, wine, flour, gunpowder, and tobacco. The cooper was a skilled trade as these containers needed to be durable and watertight for a long time. The gunsmith made and repaired firearms for the town. Gunsmiths had to be skilled in working with both wood and metal. 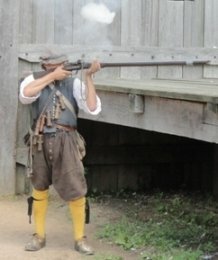 Most of the gunsmiths in colonial times spent their time fixing existing guns rather than making new guns. New guns were usually imported from England. The milliner was the owner of the local clothing store. They sold items for sewing such as cloth and thread. They also made all sorts of clothing accessories including hats, shirts, aprons, hoods, cloaks, and shifts. The milliner was often a woman and was one of the few trades that could be owned and operated by a woman during colonial times. The printer during colonial times printed all sorts of items including legal documents, newspapers, books, proclamations, and pamphlets. Setting up the type for each printing was done by hand and could take hours of work. Each page was set up and then ran through the printer. It was important that they didn't have any errors or typos. The tailors of colonial times made custom clothing of all types for both men and women. Most tailors were men, and while they made clothing for women, they made most of their money making coats and breeches for men. Tailors generally did not carry or sell cloth or ready-made clothing. Their customers would buy the cloth elsewhere and bring it to the tailor for the clothing to be made. The wheelwright specialized in making and repairing wheels for vehicles such as carriages and wagons. Wheelwrights were skilled craftsman who needed to be able to work with wood and iron in order to make a round and durable wheel that could withstand the rough roads of the colonies. Wigs were an important fashion statement during colonial times. Men of wealth and stature wore large powdered wigs. The wigmaker used human and animal hair to create wigs of various sizes and styles. The wigmaker usually offered other services such as shaving beards or dressing hair.